Look closely. Do you see it? It has great camouflage. When we were in New Mexico, we stopped along the road to enjoy the view and take photos. If I hadn’t of almost stepped on this little guy, I would have never seen him. 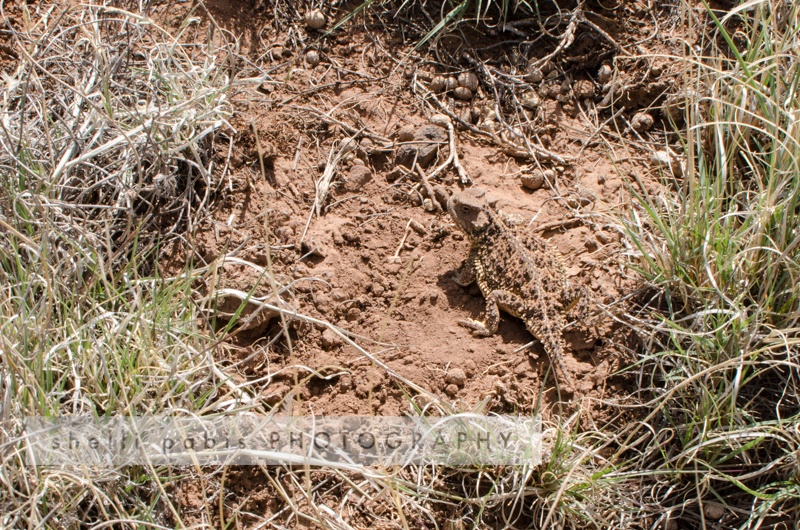 My boys knew exactly what it was and told me it was a “horny toad.” After searching on the Internet, I’ve learned that they can be called that or “horned toads,” or more accurately, “horned lizard.” There are 14 species of horned lizards. I’m not sure what species this is, but he sure was a cute little guy, and I’m so glad we had the privilege of seeing him. We saw many wild animals on our trip west that we can’t find in Georgia, which was a thrill. Unfortunately, I didn’t get any good photos of any other animals, so I’ll just share the “nature discoveries” list we made on that trip. I keep a small journal listing all our wildlife finds. At least one of us has to see an animal to make it into the journal. What have been your latest nature discoveries?